With red, puffy eyes and a fatigued, forlorn face, a woman named Mary stepped into a preschool in Springfield, Missouri, to drop off her 3-year-old daughter. Tami Parsley, the early childhood director, noticed Mary’s expression and inquired about her day. Mary broke down in tears, explaining how the night before, her abusive husband, whom she had filed a restraining order against, pounded on her door all night long. After summoning the police three times, she was a complete wreck. An interesting thing happened, though. The message of hope was slowly starting to seep in. 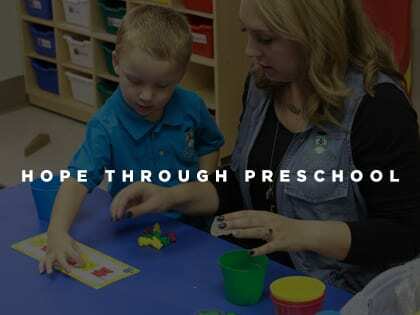 It’s this kind of transformation that Parsley and her staff witness regularly at Preschool Academy, a program that is offered for free through James River Church to families who cannot afford schooling. Located in the most underserved area of Springfield, Missouri, the school opened its doors in August 2016 to 24 impoverished students. Though James River Church, whose average Sunday attendance is 9,738, also runs two tuition-based preschools, one in Springfield and the other in nearby Ozark, the leaders wanted to offer a program that would minister to both the students and their parents in downtown Springfield. Parents can earn up to 100 points a week by doing things like dropping off their children at school clean, punctual and in uniform. They can also receive points for reading to their children and attending weekly life-skills classes. Parents must maintain a minimum of 80 points to hold their child’s spot in the program.